Publisher makes it easy to produce effective business cards, whether you create your own design or use one of the Publisher designs. You can use color schemes and font schemes to select the colors and fonts that reflect your company's image. You can further customize your business cards for specific market segments or locales, and you can add names and job titles for new employees as your business grows. You may want to take your design to a commercial printer if you have to precisely match a specific color, if you need a large quantity, or if you need precise alignments or folds. Commercial printers have sophisticated machinery and offer a variety of papers, inks, varnishes, and other options. Note: If you know that you will be printing on a specific manufacturer's product, scroll to the specific manufacturer's section, and click the product that you will be using. If the product that you will be using is not listed, follow the procedure below. Note: If you can't find your specific manufacturer or their specific product, carefully measure the size of the business card that you want to print on, being sure to exclude that portion of the card that doesn't get printed on. Click Custom Page Size, and then type the business card dimensions in the Custom Page Size dialog box. 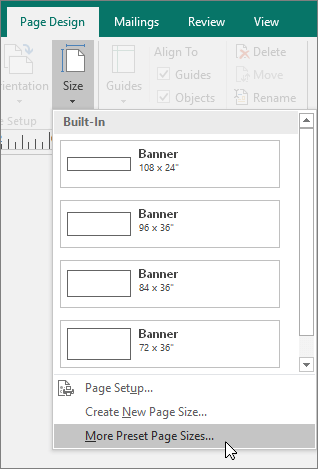 For more information about setting up a custom page size, see Custom Page Size dialog box. Note: If you stored your business contact information in a business information set, and you select a business information set, it will automatically populate your business card. 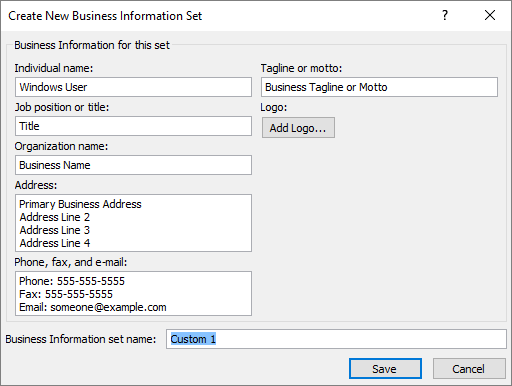 To edit your contact information or replace your business contact information with a different business information set, click Business Information on the Edit menu. Tip: Using Publisher 2010? On the Format menu, point to AutoFit Text, and then click Do Not AutoFit. Select the text, and then choose a new font size from the Font Size list on the toolbar. Tip: Using Publisher 2010? Click the logo placeholder, pause, and then click the placeholder picture again to display the Picture toolbar. On the Picture toolbar, click Insert Picture . In the Insert Picture dialog box, browse to the location with the logo that you want to insert into the publication, and then double-click the picture. Publisher will automatically size the image to fit. Desktop printers often don't align two-sided documents precisely. This is especially true if your printer does not support duplex printing and requires you to manually reinsert the paper to print on the second side. Tip: Using Publisher 2010? On the File menu, click Print. On the Publication and Paper Settings tab, choose the printer that you want to print to. Under Printing options, click One page per sheet or Multiple copies per sheet. 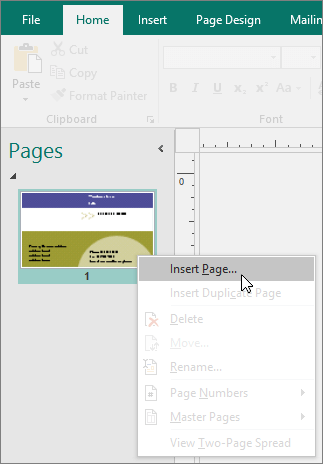 Under the Preview window, click Show how to insert paper, and then click Run the Two-Sided Printing Setup Wizard. The wizard collects information about your printer to help you determine which way you should insert the paper to test your publication. This is helpful even if you are printing a single side of a publication. Load the printer with the paper or the manufacturer's card stock that you want to print on. If you choose the Multiple copies per sheet option, you can change the number of copies per sheet by changing the Copies of each page. Tip: Using Publisher 2010? On the File menu, click Print, and then click the Publication and Paper Settings tab. Select either One page per sheet or Multiple copies per sheet. If you choose the Multiple copies per sheet option, you can change the number of copies per sheet by changing the margin and gap settings under More print options. Successful marketing requires communicating the right image of your company to your potential customers — and then continuing the relationship after the initial contact. Business cards are a key tool in those efforts. In addition to serving as a convenient reminder of your contact information, a business card introduces your company and reinforces your company's image. A business card is also invaluable in building and sustaining word-of-mouth marketing. But business cards don't do any good hiding in your desk, so get them circulating!